Eighteen separate Columbia County boards and commissions have positions coming up for re-election in the upcoming May primary election, and Thursday, March 21, marked the last day for candidates to file. In addition to elected officials, voters will also see two tax levies on the ballot — a renewal of a Columbia 911 Communication District operating levy and a tax levy for the Rainier Cemetery Maintenance District. Don Clack, the Columbia County Elections supervisor, said the majority of ballots will go out to voters on May 1. Columbia County has approximately 38,500 voters on its rolls. 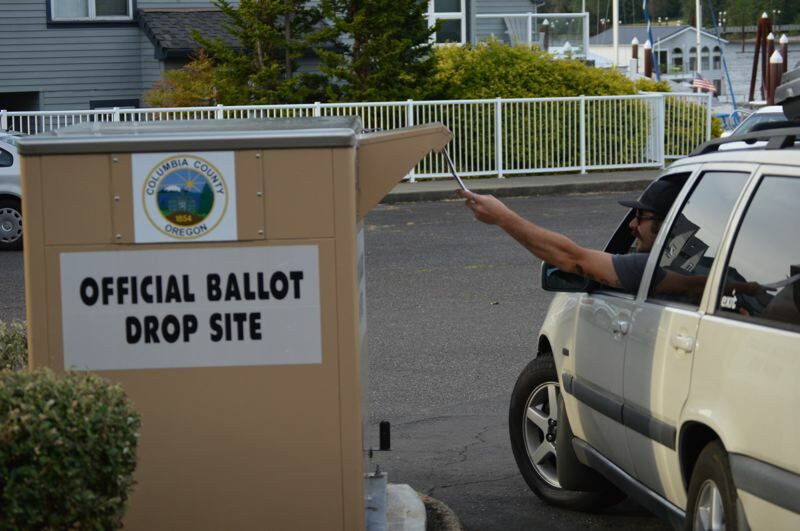 Voters mailing ballots, rather than taking them to drop boxes, are encouraged to mail them by Thursday, May 16. Election Day is Tuesday, May 21. The Columbia 911 Communications District, a special tax district that operates the county's 911 dispatch center in St. Helens, is seeking a five-year renewal of its current tax levy. If approved by voters, the levy renewal would maintain the current tax rate of 29 cents per $1,000 of assessed value. Columbia 911 Board Director Rob Anderson said last year the board "did some serious number crunching," and determined that the district is "able to live within our means right now," and increasing the levy would not be necessary. He added that the board might later consider other funding sources like general obligation bonds in the context of upgrading radio operations, but those decisions have not been made yet. At least one ad campaign opposing the renewal has been active with billboards popping up throughout the county. The ad campaign also calls for the recall of Anderson and board member Henry Heimuller, both of whom are not up for re-election. No formal recall measures have been filed with the county's elections office, however. The five-member board of directors for the communications district has three seats up for re-election. Sean Clark, of Rainier, in Zone 2, and Dave Crawford, of Mist-Birkenfeld, in Zone 4, are both running uncontested. In the race for Zone 1 in Clatskanie, two newcomers are running for the board — Barbara Odoms and Bruce Holsey. Current board member Dee Wooley is not running. Barbara Odoms is a retired emergency dispatcher who has worked with agencies in Clatsop County and on the Warm Springs Indian Reservation. Bruce Holsey is the Clatskanie Rural Fire Protection District assistant fire chief. In Scappoose, a wave of candidates seeking three open positions on the school board are all running on a platform of greater transparency, greater involvement of parents with students still in the district, and a desire to bring in fresh faces to the board. Current board members Jim Hoag, Michelle Graham, and Will Kessi are all facing opponents for re-election to their positions. In Zone 1, Jim Hoag, who is one of the longest serving board members with 37 years of experience on the school board, is running against Nikki Tetz. Tetz works in financial services and has two elementary school students in the district. She also participates in the Otto Peterson Parent Teacher Organization, runs a Girl Scout troop and has previously helped chair the annual Grant Watts Elementary School auction. In the race for Zone 6, at large, Michelle Graham, who is currently serving as vice chair and has served on the board since 2006, is running against Kevin Freimuth. Freimuth works in business intelligence and service analytics and has two children at Grant Watts Elementary School, and has two children that are not yet school age. He has also served on the Scappoose Planning Commission, the Scappoose Library District, and helped with planning the St. Helens' 13 Nights on the River events. In the race for Zone 7 at large, Will Kessi, who has served on the school board for seven years and owns a local construction and paving company, is running against Steve Kreins. Kreins works for Union Pacific Railroad, and is the executive director for the nonprofit Oregon Operation Lifesaver. Kreins has two students in the school district in middle and high school. In the race for Zone 2, Branda Jurasek, who was appointed in November as a provisional board member filling a vacancy left by Angela Schliereff, has filed to run for an elected spot on the board. Her current provisional term ends in June. She is running uncontested. Three board positions are up for re-election this year in the St. Helens School District. Melody Killens and Bill Amos have both filed to run for re-election and will head into the primaries in uncontested races. Killens is a daycare provider and was re-elected to the board in 2015, following an earlier stint from 1993-2005 as a school board member. Amos is a retired teacher and was appointed to the board before being elected in 2015. Ryan Scholl, who was appointed as a provisional board member in September filling a vacancy left by Jeff Howell, has filed to run for a full term as an elected board member for Pos. 5. Scholl is a probation and parole officer, has served on the budget committee, and has two daughters in the district. The Port of Columbia County has three positions up for re-election. Patrick Trapp, who is currently serving as board treasurer, is running against Stephen Hanson and Nancy Ward for the position. Trapp was appointed to the board last summer after Paulette Lichatowitch resigned before her term expired. Trapp previously served as the executive director of the port from 2011 to 2017, before he retired. Hanson, a Warren resident, now retired, was a longshoreman for more than 40 years. Although he does not have previous political experience, he has experience with the business side of port operations. Hanson also served in the Navy and currently volunteers with Columbia County Habitat for Humanity and the Scappoose Bread Store. Ward, a Scappoose resident who lives on a floating home, is also running against Trapp. Ward regularly attends port meetings and calls herself a "port watcher." She said a segment of Columbia County residents are not being heard and she wants to represent a different viewpoint. Mike Avent, a Rainier resident who operates a property remodeling business, has filed for re-election to his role on the board. He has been on the board for 15 years. He will face Chip Bubl and Amie Jo Kopecky in the election. Bubl, a Warren resident, works with the Oregon State University Extension Office in St. Helens and helps run the Columbia County Master Gardeners program. Kopecky, a Clatskanie resident, works as a forager and shepherd running her own business selling truffles to restaurants. Kopecky said she wants to promote more agricultural businesses in the county and represents a different viewpoint and demographic on the commission. Larry Ericksen, a Scappoose photographer, is also running for re-election for his second term on the commission. He is running uncontested.